All Sires are Bucks, but not all Bucks are Sires. I would start by saying that I have been lucky to used some very good sires. I would also share that I have tried way more sires than most other breeders that I know and that is part of why I have been fortunate enough to find some good sires. Some sires are stepping stones and some sires are foundation stones. I think it takes different sorts of stone to build a house but most importantly, a vision for what type of house you want to live in. 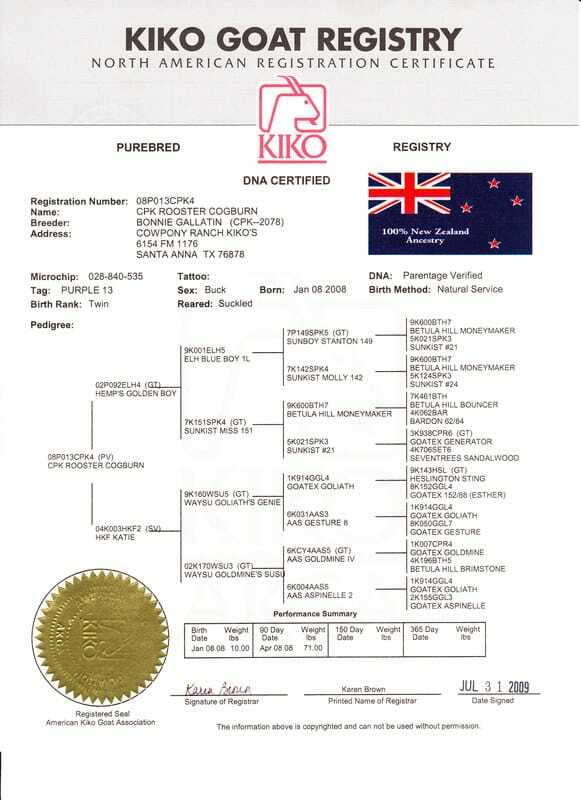 NZ Purebred - the genetics of Kiko performance royalty. The performances that made him legendary. 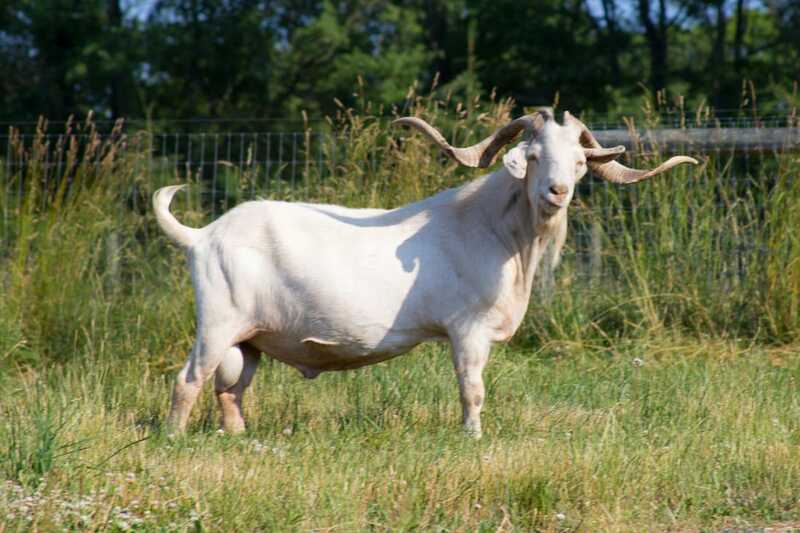 In the Spring of 2018, one of the Kiko breed’s most tested sires of all time died at the age of 10 years old. “SKY 213 Blue’s Copyright” was sired by “ELH Blue’s Son” and out of “MGR Lightin’s Lady T06” (a “Sunboy Waco 139” aka “Lightnin” daughter). His Dam, “MGR Lightin’s lady T06”, was herself out of “VIC Victoria Farm Puddin”, who was a “SPK Sunboy 117” (“Loverboy”) doe. “Copyright” as he became known, was one of those sire’s known by his nick-name after siring over 25 tested bucks at 3 different tests over multiple years with many winners, record breakers and top-10 finishers along the way. He was born at Blue Sky Kikos in Oklahoma. He was used by Blue Sky Kikos and Sandness Livestocks’ breeding programs for one season in 2010 after he was selected as a herd sire from the same crop of “ELH Blue’s Son” kids as “SKY Xclusively Blue” and “DSL Blue Son 110”. Those does that were bred by Copyright in 2010 were dispersed, (as was Copyright) in the Fall and Winter of 2010. Nine kids were registered from those breedings. Those included GAL Sabrina who later in her career produced an excellent test buck for Good As Gold Kikos and James Sanders. 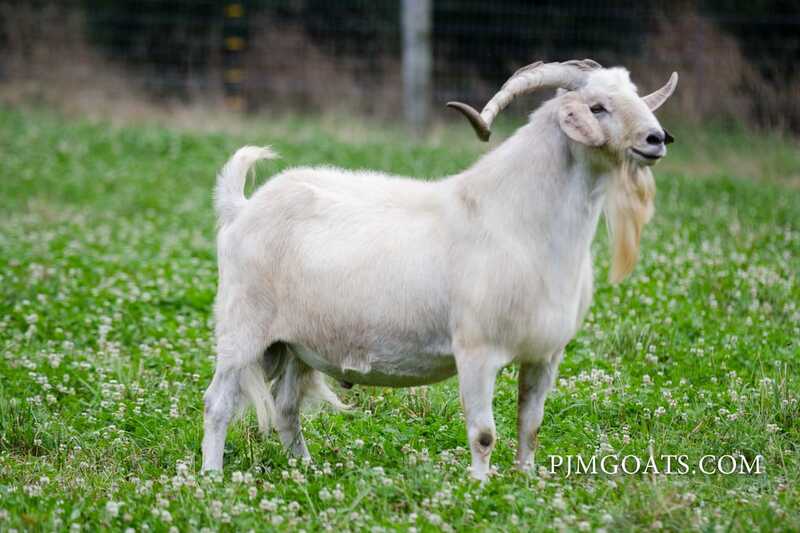 Copyright was sold in the Fall of 2010 as a 2 year old and we purchased him here at PJM Goats. He travelled to New Jersey. He caught a ride with Wes Pinneo from Duff Sandness’ farm to the “Cream of the Crop Sale” venue where we met up with Wes Pinneo in the parking lot for the exchange. The late Craig Adams of Illinois and Luke Miller of Indiana helped load him as he was an especially independent spirit in those days. Copyright had been too late arriving to PJM Goats in New Jersey to be used in 2010 but was used in the fall of 2011 on a small sample of does and we had his first crop of kids at PJM Goats in 2012. His kids really excelled in that kid group. We were using multiple different bucks at that time and the Copyright kids started to stand out in the kid group that summer of 2012. Their growth rate was exceptional and they exhibited excellent hardiness. Copyright was used on a larger proportion of the herd that Fall and his 2013 kids were sent to several tests. As luck had it, that was the year with the highest death rate at the Maryland Test and there was almost a break down in the test. It was the perfect storm of no supplementation with high stocking density and heavy worm burden. A buck sired by Copyright reached the final selection group that year - “PJM Copyright’s ABC”. He was the youngest buck kid to make the final selection and had an average FAMACHA score of 2.2, an average FEC of 1019 and an ADG ratio of 148%. There was also another Copyright kid that had an ADG of 130% that year. 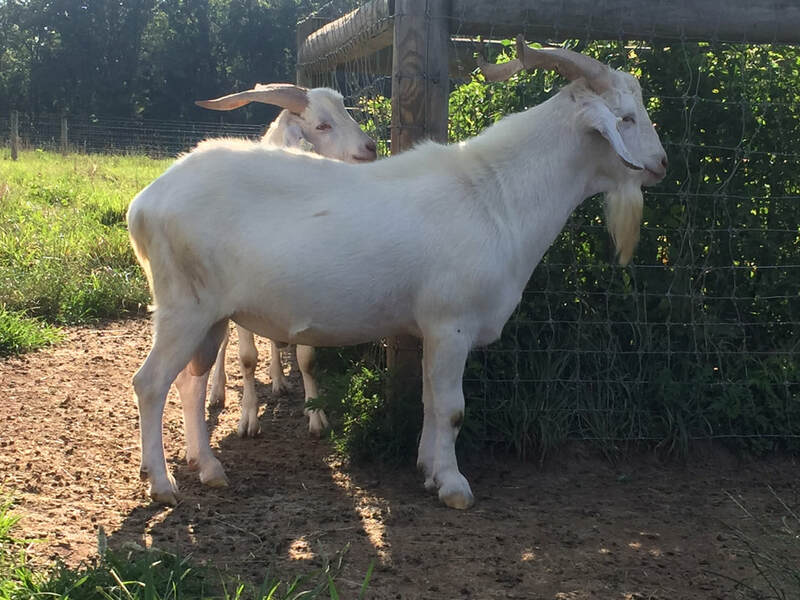 Copyright had started his central performance test career showing his kids could hang with the toughest goats and gain weight. “PJM Copyright Tough” went through that 2013 Maryland test and went to work with Wes Pinneo at B Bar W Kikos in Kansas. ”Tough” was the 2013 High Pointed AKGA “Performance Test Program” buck of 2013. In 2014, Copyright’s kids again excelled at the Maryland Forage-Based test. Again he showed his kids were hardy when none of his kids required deworming in 2014. Again he had a buck kid reach the Final Selection group where certain minimum FAMACHA, ADG and FEC scores were required to meet high standards. That buck kid was “PJM Copyright Tru Test MD15”. He had an ADG ratio of 189% and an average FEC under the Silver Standard of 1,000 at 943 EPG. His average FAMACHA was just 1.4 and he required no medical interventions. However, it was at the “feed-lot” tests of Pennsylvania and West Virginia of 2014 that Copyright really set himself apart from all the sires that came before him or since. In 2014 he had buck kids entered in the Pennsylvania and West Virginia Buck Tests. In the “West Virginia Buck Test” several of the Copyright bucks smashed the ADG record that been held by “MGR Titan’s Hammer” and before that, his sire “AKR Lightin’s Titan”. Copyright’s Dam is a full sister to “AKR Lightnin’s Titan”. In Pennsylvania in 2014, Copyright had 3 bucks and one grand-son buck (sired by “PJM Copyright King”) entered. The kids were very young to go to that test. In the end, they did very well with on-test ADGs of between 0.48 pounds per day - 0.54 pounds of ADG with WDA (Weight per Day of Age) gains of between 0.60 - 0.66 pounds per day. In West Virginia, the bucks had a chance to reach weaning age before the test started and they could get adjusted before going on the test. The records were smashed in West Virginia. Copyright had 4 bucks entered and “PJM Copyright King” had 1 buck at the test. The “Copyright King” buck (PJM CK’s Surprise D36 - later sold to research at Rhode Island) finished with an ADG of 0.71 - this broke Hammer’s record of 0.63 pounds ADG. However, the four Copyright Bucks had ADGs that ranged from 0.79 to 0.89!!. This was totally unprecedented gains for Kikos to that point and the 0.89 pounds gained by “PJM Copyright Winner WV14” stands still as the highest ADG of all time in the Kiko breed. “Winner” actually gained 1.1 pounds per day during a short phase of the test - also passing Hammer’s record of average daily gain over a short period. Copyright had shown that Kikos could compete head to head for good ADG figures with Boer Goats and were viable feedlot goats. The test results also showed that Kikos could carry muscle and sail up to 80 pounds (and over 110 pounds) if they had the right genetics and were farmed in a manner to allow that rate of growth. To that point, it was unproven that Kikos could break the 0.63 pounds per day ADG. In 2015, Copyright’s progeny got a rest from testing and it was the turn of his “grand kids”, sired by “PJM Copyrights Bluejay”. 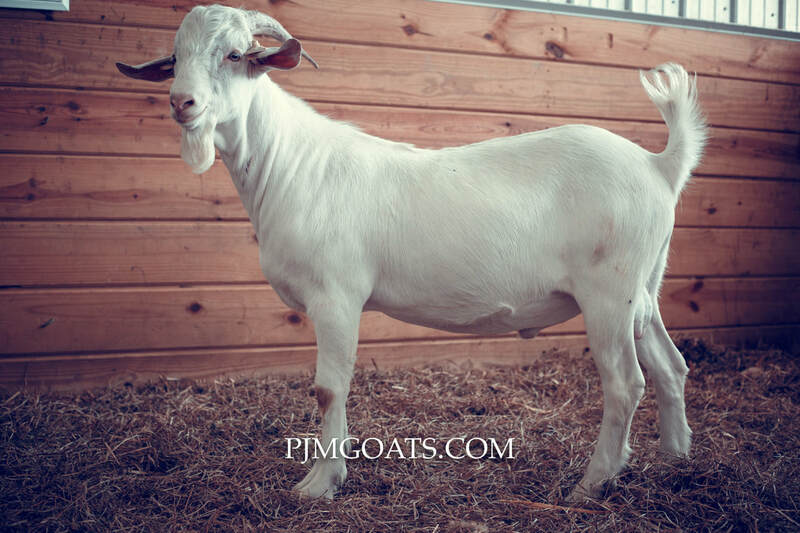 “Bluejay” was selected from the 2013 crop of kids at PJM Goats. 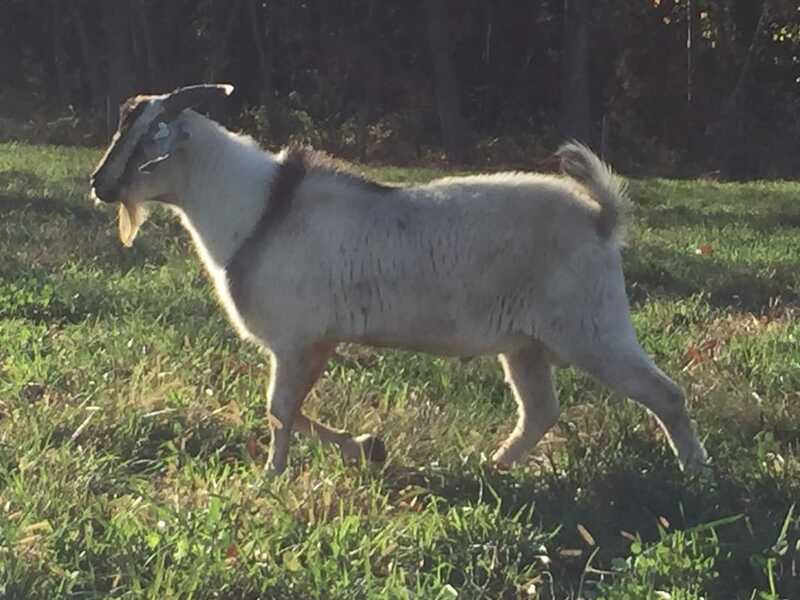 Bluejay had a set of kids entered in the Maryland Forage-Based Test and five head to the West Virginia Buck Test in 2015. In Maryland, the Bluejay kids showed excellent ADGs in the “Growth Phase” (first half) of the test. 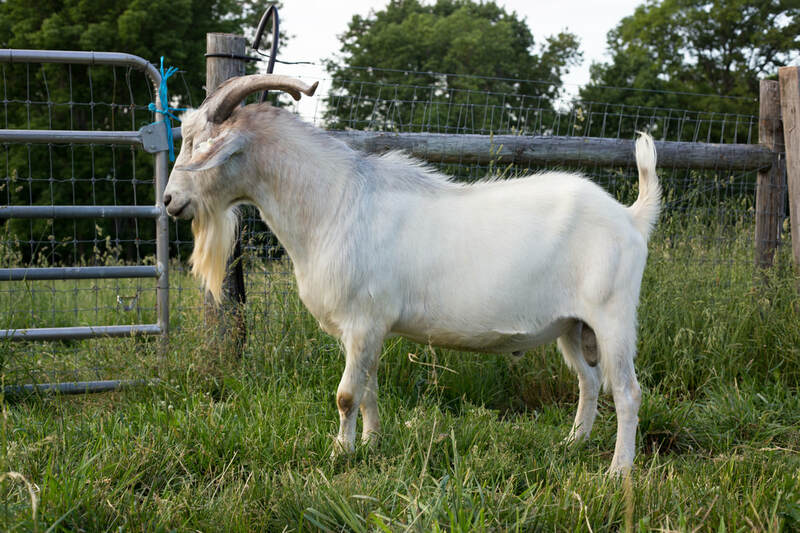 One of the Bluejay’s was the highest ADG goat at the half-way point of 42 days at 0.454 pounds gain per day. 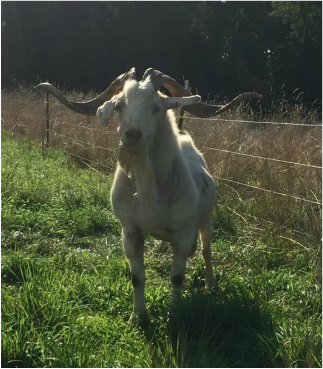 He was the heaviest goat in the test also at 95.8 pounds. The PJM consignment was by far the heaviest in the test. None were dewormed during the test. He had a buck that made the final selected group also - “PJM Hard As Nails”. “Hard as Nails” had the distinction of starting and proceeding through and finishing the test with a FAMACHA Score of 1. He had an average FEC of 817 EPG and an WDA that was 3rd out of the final ten bucks selected. We have retained a number of “PJM Hard As Nails” daughters at PJM Goats and expect kids from them in 2019. In West Virginia in 2015, the PJM Copyrights Bluejay bucks really excelled. That year there were Boer and high percentage Boer goats entered in the test. The PJM Kikos easily stayed in the competition with them and in the end, a percentage Boer and “PJM Bluejay’s Twist” were neck and neck to be the winner. The test administrators decided to class the Boer and Kikos separately that year. In the Kiko division, Bluejay sired the first, second and third placed bucks. He also sired the sixth and seventh placed bucks. The winner was “PJM Bluejays Twist”. His final test Index ratio was 121 overall using the test formula. He came off the test at 119 pounds, his ADG was 0.84 pounds - placing him at the second highest KIKO ADG of all time. His LEA Ratio was 133%. His RFI was -1.22 (used less feed than the average of the test goats) and to top it off, he has the largest scrotal circumference! He was one of my personal favorite bucks that I have bred. By this time in the Fall of the 2015, Copyright had shown through “PJM Copyright King” and in 2015 through “PJM Copyrights Bluejay” that he could pass on his ability to be hardy and have high daily gain genetics in his descendents. In 2016, Copyright progeny was entered in Central Performance Tests for the last time. He impressed as much as ever. 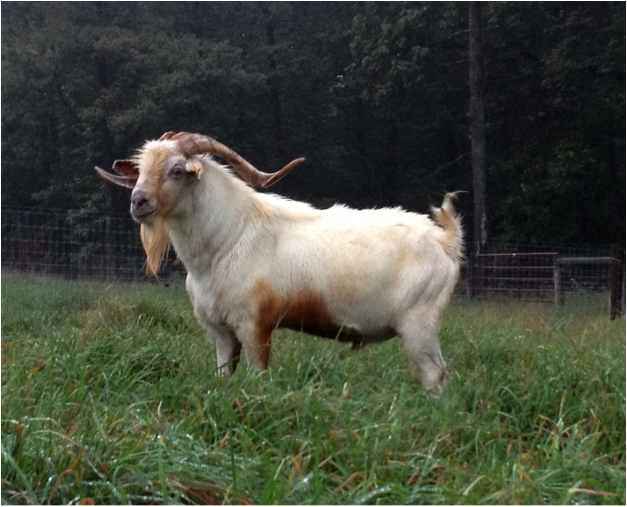 That year he had the highest ADG buck (Tag 649) at the end of the “Growth Phase” at day 42 at the last Maryland test. The consignment of four bucks had the heaviest average weight bucks (average per head) consignment at the end of the “growth phase”. His buck, “PJM Top five MD16”, had the best FAMACHA of the test with an average of one through the entire test!! “Top Five” had an ADG ratio of 172% and an average FEC of 830. The ADG ratio for the Copyright buck, “PJM Steel Nails” was an impressive 218% with an average FEC of 1922 and an average FAMACHA of 1.83 through the test. Meanwhile in the 2016 WV test, Copyright bucks were setting themselves up for the future. Of the three Copyright bucks tested in West virginia in 2016, he sired the highest REA buck of the entire test with a REA ratio of 129. The next closest bucks were at 118. This was nothing new, he had done that in Pennsylvania in his kids class in 2014 and again in the 2014 West Virginia Test. That high REA buck is “PJM Copyright Crossfire”. “PJM Doe Maker” also went through the WV Test to be used in the PJM breeding program. Named with a nod to his Dam - “PJM Austin/KiwiKing B16” - one of the best Austin Boy daughters with an excellent udder. Additionally, a Copyright daughter was the Dam to the second place buck in the WV test. Showing again his prepotency and ability to contribute positively to his descendants’ genetics. Copyright finished his Central Performance Test career with amazing success.He lived another two years to die in the Spring of 2018 at 10 years old. 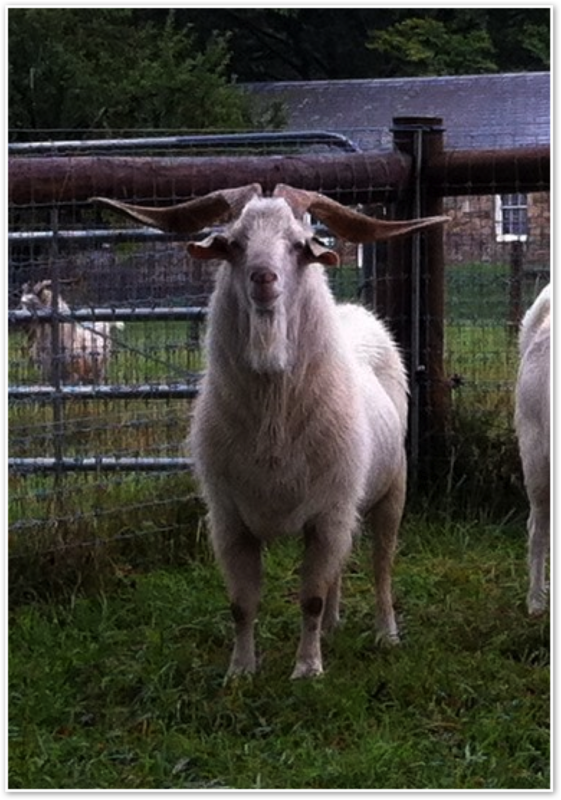 However, Copyright’s genetic legacy lives on in his progeny through the breeding program at PJM goats. 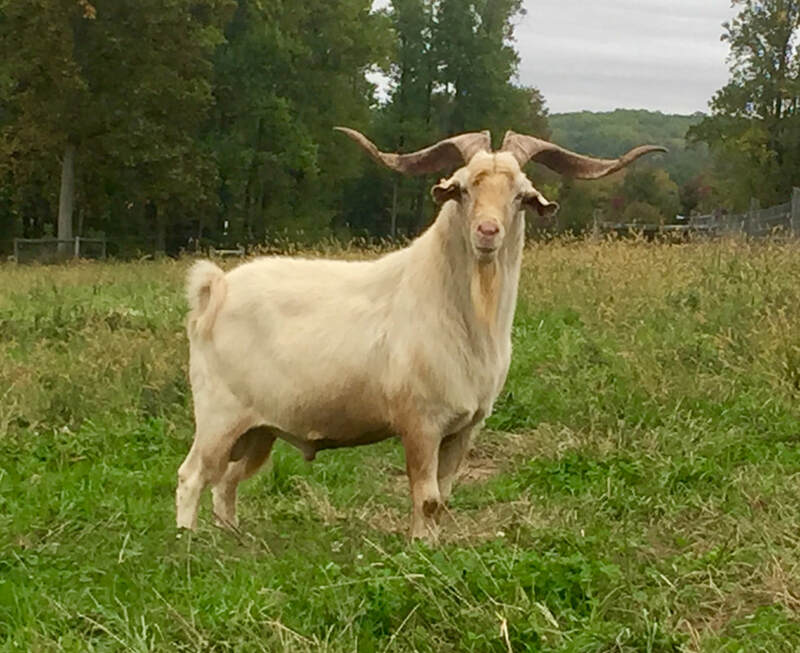 His son, “PJM Copyright Crossfire WV16”, went on in 2017 to sire the winner of the West Virginia Buck Test and the seventh place buck out of only 2 entries sired by him. The winner, “PJM Crossfire Copybook WV17” also had the thickest Rib Eye Area. His REA ratio was 13 points higher than the closest other buck. “Copybook” had an ADG that was 19 points higher than the closest buck. His test index was 15 points higher than the next highest buck. 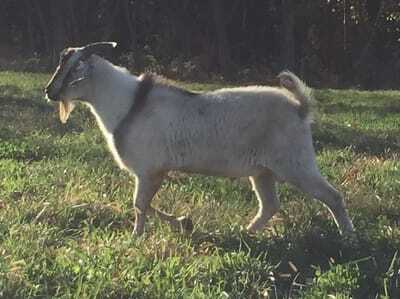 In 2018, the Copyright buck, “PJM Doe Maker WV16” sired a seventh place buck in the 2018 test. His Dam was sired by the 2014 WV tested buck, “PJM Record Breaker”. Making the kid double-bred to Copyright. In summary, Copyright changed what we know about the Kiko breed. His progeny grew faster than any sire in the Kiko breed. His progeny went through the toughest forage tests with no deworming or medical help. His progeny’s FAMACHA scores were unusually good. His daughters have produced multiple successful test bucks. In short, Copyright has set a standard that other bucks will find difficult to match and it will be even more difficult to surpass. His genetic legacy is alive and strong through his descendents and his contribution to the breed will be felt for quite some time. “Blue’s Copyright”, a Full NZ Purebred, is sired by Blue’s Son (A 50%Genetic son of Money Maker) and his Dam, a Daughter of Lightin’, is a full sister to Titan. Titan is the sire of Hammer. Both Hammer and Titan held records for Average Daily Gain in a performance test. In fact, Titan held the record at the Valley Forge Test in GA until that record was broken by his son Hammer. Hammer's record was broken during the summer of 2014 in West Virginia. The current record holder is PJM WV Winner. The next 3 highest ADGs are all sired by Blue's Copyright or PJM Copyrights Bluejay and from different does. Blue’s Copy Right is a very wide and well made buck. He has great width over his shouders and has great body length. He sires very fast growing and well made kids. He has black feet and dark skin and a blue-red roan colored coat. 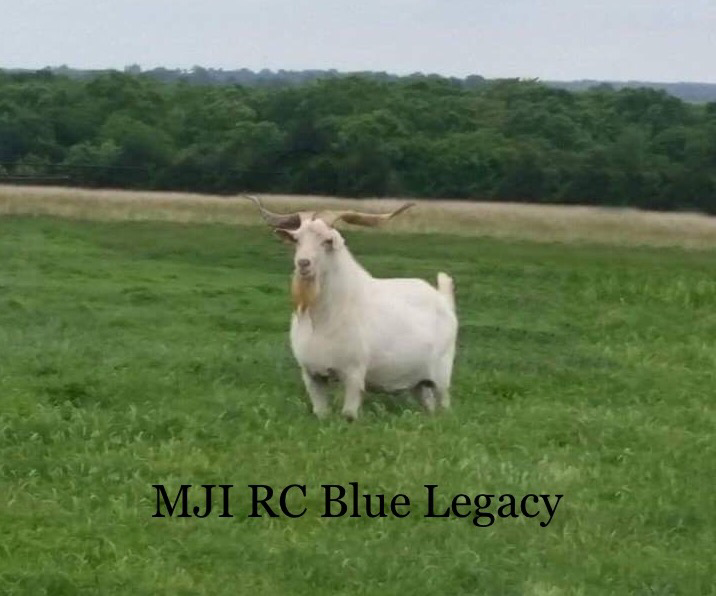 PJM Copyright Crossfire returned from the WV 2016 test and was examined along with the other 7 goats I sent. He and his half-brither Doemaker were selected to stay a little longer for further evaluation. Crossfire finished the test as the thickest REA from about 40 bucks at the test. What is more amazing about him is that 2 three quarter brothers (Same dam with sires 50% related to Crossfire's sire) both finished as the top REA bucks in their year's test - 2014 in PA and in 2016 it was "Crosscut" that did the same in WV. This buck carries the genetics for heavy muscle and we are pursuing that. UPDATE: Crossfire is the sire of the first and second placed for ADG in the WV Test of 2017 at the second weigh-in at 42 days. PJM Hard as Nails was bred for 2017 kids to some very nice does, including a "Generator" doe. I am looking forward to seeing his kids. Hard As Nails held a FAMACHA OF 1 for the entirety of the 2015 Maryland Test. One of only two bucks to do so out of about 100 bucks on the test. 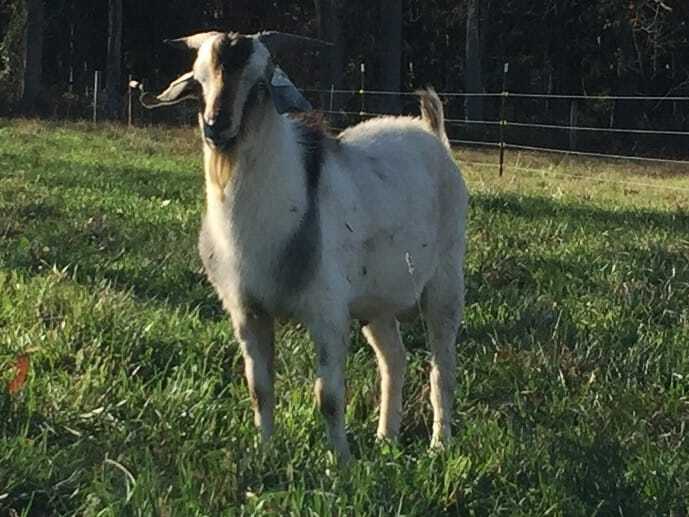 GIN V22 - "Premier Dale"
GIN W07 - "Kiwi King"
In 2015 Legacy came to PJM Goats and we used him to produce some very nice kids. Two of his buck kids produced here tied for joint second place at the 2016 WV Buck Test. We have retained some of his progeny to use in our program and he now stands with James Sanders. We expect him to continue to contribute very positively to the Kiko breed. ​HKF Flip was sired by HKF Little Joe. 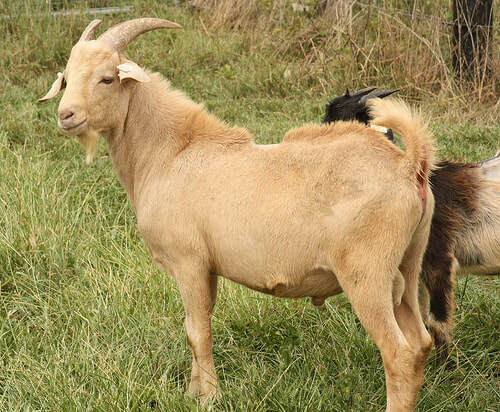 He was a thick goat with muscle like his sire Hemp's Golden Boy. Little Joe's dam was a "Big Boy" daughter who was out of a double bred Goliath doe "Harriet". Flip's bottom side shows his Dam was also a grand daughter of "Harriet". His maternal grand dam was sired by JFK Noble who combined Tasman Aristocrat and Terminator genetics. HKF Flip has correct legs and tight black feet. He is well made and holds a dark FAMACHA through the year. He made a good cross on our stock and expect him to contribute very positively to the breeding program of Steven Tenedidios of New York at his new home. Rooster came to us at the very end of his breeding career and we were happy to have him spend his last summer with us. He fleshed up and shed out to look like the power house he was. CPK Rooster Cogburn in old age. Rooster spent nearly all his breeding career with Shane Hesterman and Shane liked him well enough to base his line breeding program on him. We used him on some of our best does in his last year of breeding in 2016.